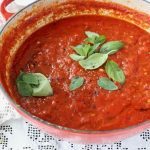 How to make the best, authentic Italian Marinara Sauce recipe from scratch, with organic San Marzano tomatoes, garlic and fresh basil. Video Below! 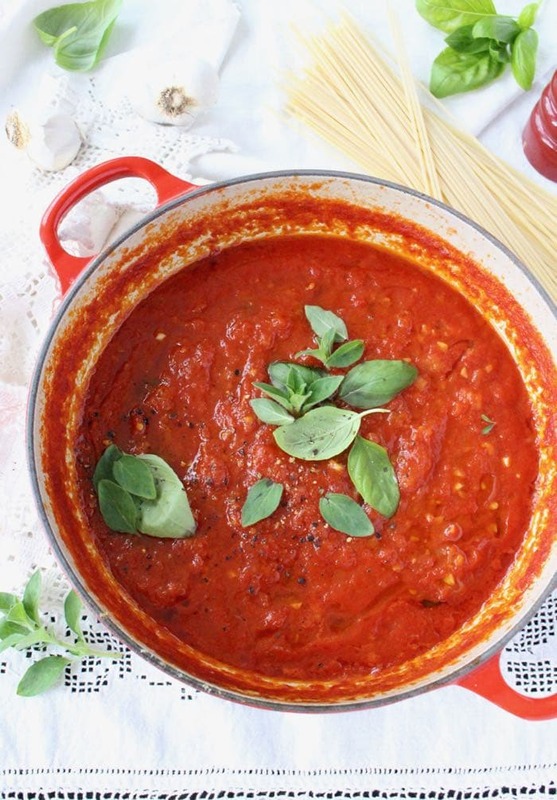 Easy, chunky, creamy, rustic, hearty, flavorful marinara sauce or as known in America “Sunday Gravy” , is made at home with a few ingredients and a little patience. This is so good you’ll never be able to buy it in a jar. Gotta make your own kids! 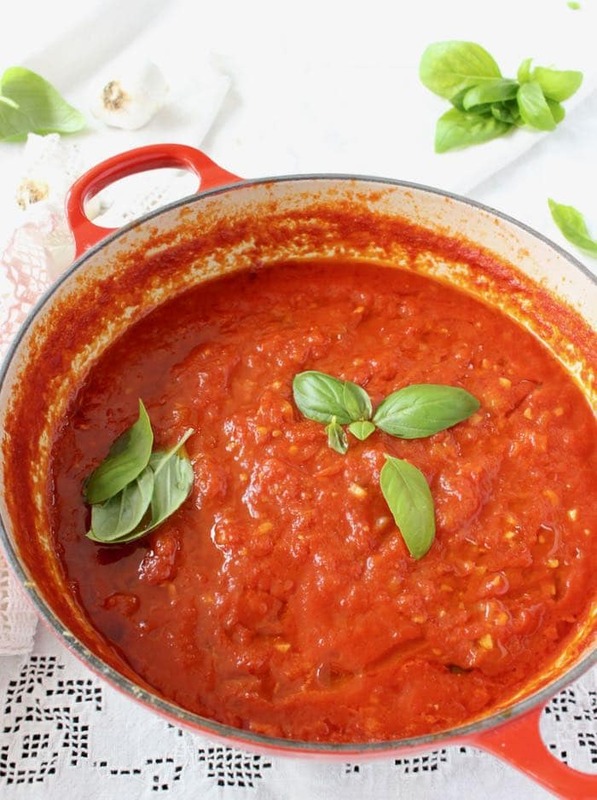 The secret to the classic Italian sauce, lies in slowly simmering the tomatoes with onion, basil and garlic until thick and reduced and the natural sugars have concentrated their flavors. So thick you can literally use it as a pizza sauce as I do of course. There is no heavy cream, no wine and no anchovies in an authentic marinara sauce. 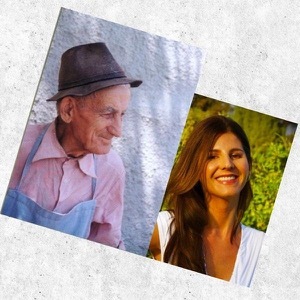 It is a simple vegan and vegetarian sauce that you can serve with spaghetti and ricotta meatballs, clams and mussels, shrimp, chicken parmesan, ricotta gnocchi, peppercorn steak, mushrooms, eggplant, ravioli, lasagna or whatever your favorite pasta is. Even perfect for dipping your cheese sticks! 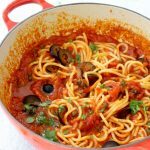 Q: How to thicken marinara sauce ? A: Continue cooking on low flame until most of the water evaporates and the gravy has thickened to your liking. Careful not to burn it tough. 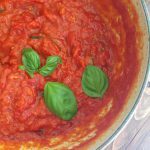 How to make the best, authentic Italian Marinara Sauce recipe from scratch, with organic San Marzano tomatoes, garlic and fresh basil. Heat a heavy bottom large pot on medium low flame. Add a lug of olive oil and the diced onion with a pinch of sea salt. Cook for about 10 minutes until traslucent taking good care not to burn it. Stir in the minced garlic and let it infuse the oil for about 30 seconds. Use your hands and crush the tomatoes as you add them to the pot with the onion and garlic. Rustic chunks are what we are after. Add the bay leaf and the 4 sprigs of basil then bring everything to a gentle simmer. Partially cover with a lid and cook down until reduced and thick to your liking. About an hour or so. Stir a few times making sure the sugars from the tomatoes don’t stick to the bottom. After the sauce has reduced season to taste with the sea salt. Discard the bay leaf and basil sprigs. Finish with a drizzle of extra virgin olive oil and the reserved fresh basil. Serve with your favorite pasta to transfer to jars and refrigerate up to one week. Tried this recipe a couple of weeks ago and it turned out great! I froze most of it in 350ml glass clip jars to bring out as needed and each time the family love it. Just making up my second batch! I’d like to substitute fresh Roma tomatoes. How many should I add? 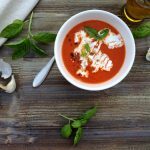 Hi Peggy, this recipe needs those San Marzano canned tomatoes, using a fresh Roma tomato variety will give you a different result. You’ll probably need about 4 lb or so. Hi! I’m trying this now for the first time. I’m a little confused on what to do with the 1/3 cup torn basil. Please advise and thank you. Just add it in at the very end of cooking. Absolutely loved this sauce. 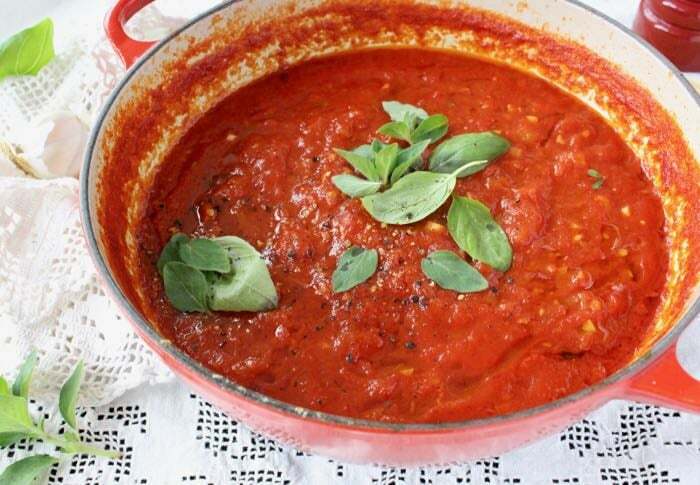 The certified San Marzanio tomatoes do bring the game to this sauce.. I made this with your recipe of ricotta meatballs. They melt I need your mouth. Excellent thank you. Soooo great! I added about 1.5 cups amaranth in the last 20 minutes to help thicken (had some in my cupboard I’ve been trying to use up). Also, added the basil leaves at the beginning tather than at the end and in place of the sprigs (got confused) but I love how it turned out. So easy and so tasty! I freeze it into ice cubes to serve with my pasta for a couple of months a la Trader Joe’s frozen pastas. Thank you!